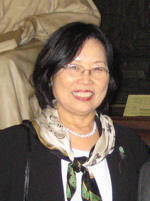 On the occasion of her retirement in June 2015, Professor Emeritus Young-Key Kim-Renaud, with her husband, Dr. Bertrand Renaud, made a gift of $50,000 to the Department of East Asian Languages and Literatures in order to enable the continuation of the East Asian Humanities Lecture Series, originally funded by the Columbian College of Arts and Science Dean’s Office. The lecture series aims to bring specialists in East Asian humanities and cultures to GW to encourage cross-disciplinary discussions. The lecture series was renamed “the Kim-Renaud East Asian Humanities Lecture Series” beginning in 2016. We are delighted that we can continue the lecture series thanks to Professor Kim-Renaud and Dr. Renaud's generosity. The establishment of the above fund came in addition to the $300,000 Professor Kim-Renaud and Dr. Renaud contributed to the Young-Key Kim-Renaud Fund for Korean Language and Literature, established with the aim of permanently endowing a new professorship in the Korean humanities. With the help of her family and personal friends, Professor Kim-Renaud has raised $900,000 towards her $2.5 million goal. We are immensely grateful for her effort. Professor Kim-Renaud hopes that the GW community (including alumni) will rally around her mission and add to one or both funds with their own donation. Make a difference. Give today to the Young-Key Kim-Renaud Fund for Korean Language and Literature!